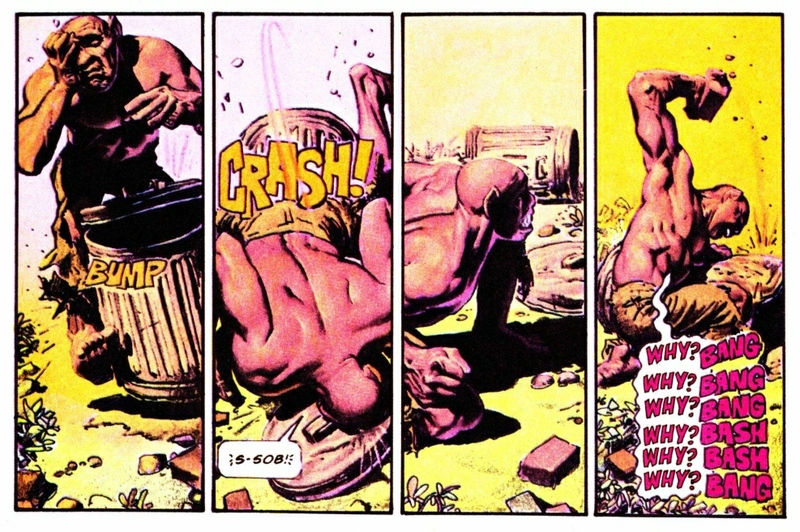 Just thought long-time friends of RCN might like to know that Richard Corben and his wife, Dona, have tweaked the design of Corben’s website, have added some new content, and have purchased a new domain: CorbenComicArt.com. I’ve already updated all of the links in my previous posts here at RCN to reflect the change, and I encourage others with blogs and websites to do the same. On Saturday 23 August 2014 at 12:00 noon CST, thirty-six pages of original black-and-white comic art by Richard Corben will go on sale via the “Sales” page on the artist’s official website. The sale will include all seven pages of “Dagon” from Haunt of Horror: Lovecraft #1 (2008), all eight pages of “The Music of Eric Zann” from Haunt of Horror: Lovecraft #2 (2008), all ten pages of “The Sleeper” from Haunt of Horror: Edgar Allan Poe #1 (2006), and ten interior pages and Corben’s cover art for the Hellboy: Double Feature of Evil one-shot (2010). All artwork is drawn in Sharpie and Pigma pens on 11 x 17 inch Strathmore paper, with the exception of “Dagon,” which is drawn in Sharpie and Pigma pens, and Prismacolor pencils. The small scans that are on the Corben website right now are intended for “viewing only.” Prices will be posted when the sale goes live on Saturday 23 August 2014 at noon CST, at which point the first person to complete the PayPal shopping cart for each page will receive that page. On Saturday 28 June 2014 at 12:00 noon CST, thirty-one pages of original black-and-white comic art by Richard Corben will go on sale via the “Sales” page on the artist’s official website. All artwork is drawn in Sharpie and Pigma pens on 11 x 17 inch Strathmore paper, with the exception of “Roda and the Wolf,” which is drawn in markers, Sharpie and Pigma pens, and Prismacolor pencils on 12 x 15 inch Bainbridge paper. The small scans that are on the Corben website right now are intended for “viewing only.” Prices will be posted when the sale goes live on Saturday 28 June 2014 at noon CST, at which point the first person to complete the PayPal shopping cart for each page will receive that page. On Saturday 18 January 2014 at 12:00 noon CST, thirty-one pages of original black-and-white comic art by Richard Corben will go on sale via the “Sales” page on the artist’s official website. The sale will include ten pages from Mutant World by Strnad and Corben, eleven pages from Cage #1 by Azzarello and Corben, and all ten pages of “The Lamp,” adapted from Lovecraft by Corben and published in Haunt of Horror: Lovecraft. All pages are drawn in Sharpie pens and Pigma pens on 11 x 17 inch Strathmore paper. Scans of the pages are on the Corben website now for “viewing only.” Prices will be posted when the sale goes live, at which point the first person to complete the PayPal shopping cart for each page will receive that page. On Saturday 26 October 2013 at 12:00 noon CST, thirty-one pages of original comic art by Richard Corben will go on sale via the “Sales” page on the artist’s official website. 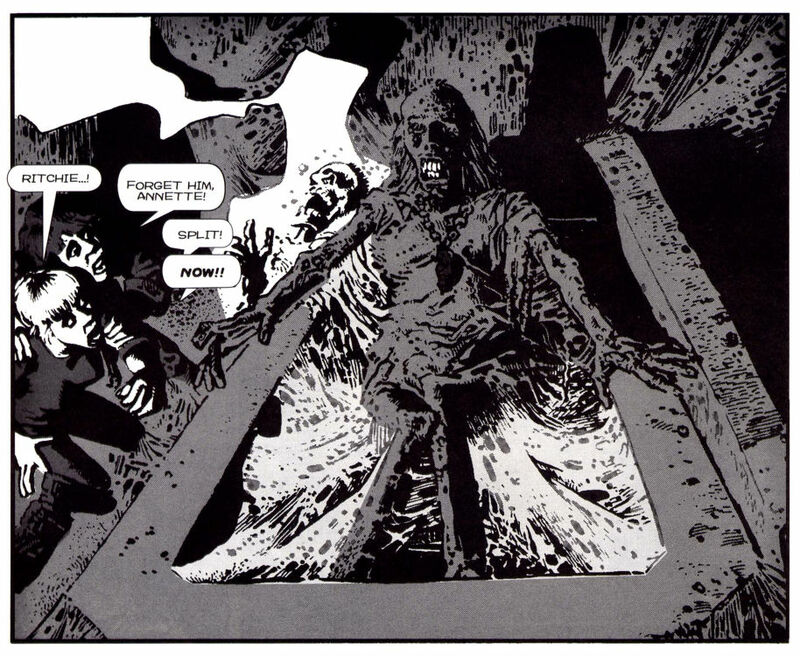 The sale will include ten pages from two issues of Ghost Rider, ten pages from Hellblazer: Hard Time, and all eleven pages of “Tales of the Black Diamond, Crypt of Blood,” with script by Rich Margopoulos, a story that was first published in Horror in the Dark #3 (Fantagor, 1991). 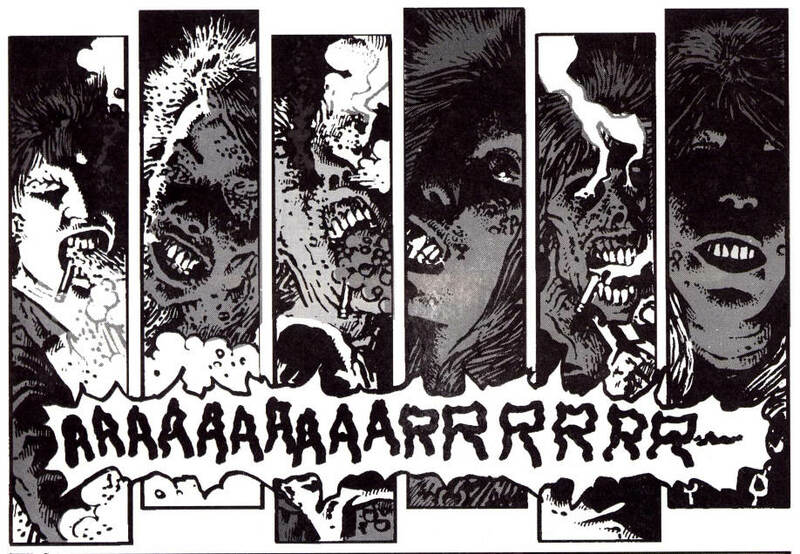 Scans of the pages are on the Corben website now for “viewing only.” Although the images are tiny, they are nonetheless large enough to see, for instance, that the grey tones used to establish the midnight mood of the published version of “Crypt of Blood” are not part of the original art. All prices will be posted when the sale goes live, at which point the first person to complete the PayPal shopping cart for each page will receive that page. 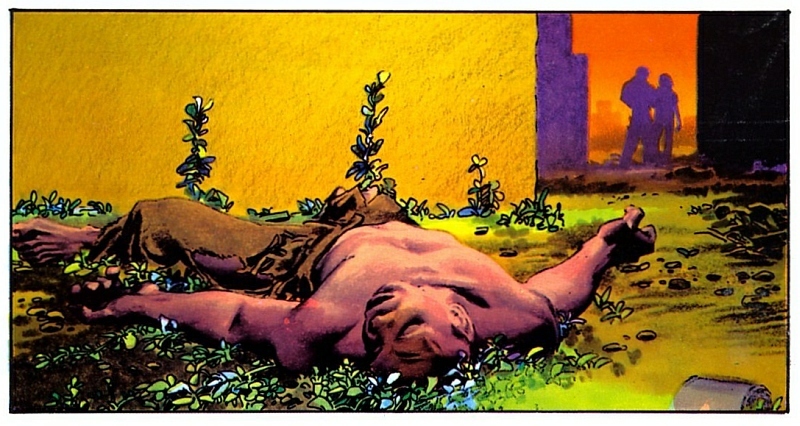 On Saturday 27 April 2013, thirty pages of original art by Richard Corben will be available for purchase via the Sales page on the official Richard Corben website. The sale will include 1) all eight pages of Corben and Lovecraft’s “A Memory,” first published in Haunt of Horror: Lovecraft #1 (2008), 2) all eight pages of Corben and Stenstrum’s “Unprovoked Attack on a Hilton Hotel,” first published in Creepy #73 (August 1975), 3) all eight black-and-white pages of the fourth instalment of Corben and Strnad’s Mutant World, first published (in colour) in 1984 Magazine #4 (October 1978), and 4) six other pages, including two Haunt of Horror: Lovecraft covers. Small preview images of all of the artwork included in the sale are on display on the Corben website right now. Prices will be posted when the sale goes live Saturday 27 April 2013 at 12:00 noon CST, and after that, whoever completes the PayPal cart first will receive the art. The last time Mutant World pages were up for sale via the Corben website, they were sold by auction, with the bids being submitted via email over the course of a week (if memory serves); this time, however, all of the pages will be individually priced. Previous Corben art sales have sold out quickly, so good luck to everyone who hopes to obtain a page next weekend. More pages from Richard Corben’s personal inventory of original comic art by Richard Corben will go on sale via the “Sales” page on the official Corben website on Saturday 26 January 2013 at noon CST. Thumbnail images of the pages that will be up for sale are on the site now for preview. a promotional illustration for Empire of the Dead. “Buy-it-now” prices for all except the Mutant World pages (which will be “on auction”) will be posted when the sale goes live. More details about the auction of the Mutant World pages will be posted on Corben’s “Sales” page on Saturday 26 January 2013.